As the singer and guitarist in Sheffield-based trio Standard Fare, Emma Kupa established herself as one of the indiepop scene's leading luminaries. After releasing a handful of singles and two critically acclaimed albums, the band broke up at the start of 2013. Shortly after, Kupa moved to Cambridge, hooking up with bass player Mark Boxall and drummer Tom Barden to form Mammoth Penguins. Having spent the ensuing two years writing and honing the songs that would eventually form their debut long player Hide & Seek, the record was finally released on Fortuna Pop! in July. DiS recently caught up with the trio and discovered that aside from being Land Of Talk obsessives, the best way to be accepted by the Cambridge music scene is to fill your band full of instruments. DiS: How did the band get together? Emma Kupa: My previous band Standard Fare played in Cambridge a couple of times with Mark's band. He's lived in Cambridge quite a while. Then I moved here and a band was formed. Mark Boxall: We'd played a lot of gigs together with our previous bands, so it was just a geography thing really. Emma Kupa: I guess we connected musically, otherwise it wouldn't have gone anywhere. We wanted to start a band like Land Of Talk. We didn't manage it but that was the plan. Then our drummer left and we got Tom. And Tom's awesome! DiS: Your debut album Hide & Seek came out in July. Were the songs written specifically for the record or have they been knocking around for a while? Emma Kupa: Some of them have been around for a couple of years, since I moved to Cambridge. Tom and Mark tend to write things more quickly. DiS: Is there a specific theme or concept running through most of the songs on Hide & Seek? Emma Kupa: Not really. It's just general relationships and life from my experiences with them. DiS: How do you choose which songs to bring to Mammoth Penguins and which to use for your solo project? Emma Kupa: I'm still figuring it out. The solo record was easy because I realised I was writing songs about completely different topics. Plus with the Emma Kupa thing there's no co-writing, so I just take an idea and work with it. Whereas if I bring a full-on song to practice, it will probably end up being a Mammoth Penguins song. DiS: Is the writing process quite democratic within the band? Tom Barden: Emma writes most of the words and we all contribute the music. Tom Barden: Like if we think Emma's written a great chorus without realising we'll point it out then try and structure the song around it. Emma Kupa: It's the motivation and the energy that's really exciting. And that we all respect each other's opinions too. DiS: Musically I can hear reference points from as far back as the 1950s. Was it your intention to encompass so many different sounds and genres? Emma Kupa: I guess it just came out like that because we all listen to a lot of different stuff. Tom and Mark are both classic drum and bass players so they're quite adept at finding a beat. Mark Boxall: Sam Cooke is a big influence. Tom Barden: I went on this trip to Nashville a few years ago and I was staying with my friend. He drove us to Memphis for the day and we went on a tour of recording studios. We visited Sun and looked at the studios there. Then we went to Stax and looked around that studio as well. Afterwards we drove around the area where Stax is situated which was really poor and run down whilst listening to Big Star, who also recorded there. It made me listen to a lot of the music that originated from those places, and when you think about it, country, soul, funk, gospel. Everything that's come about since then all has its roots in the same thing. So I think it would be impossible for our music not to be influenced by or reference those genres to some degree. DiS: How does the music scene in Cambridge compare with the one in Sheffield? Tom Barden: Is there a Cambridge scene? There's definitely a Norwich scene. Mark Boxall: Cambridge is full of lots of different people doing their own things so the chances are you might never cross paths with most of them. Tom Barden: There's only really one decent venue in Cambridge. The Portland. 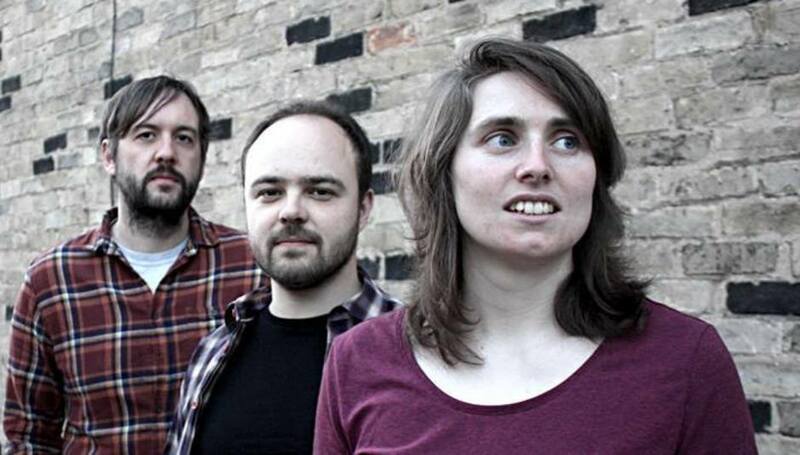 Emma Kupa: I don't think there are any other bands like us in Cambridge. Most Cambridge bands have loads of instruments in them. Tom Barden: Because we've been playing in Cambridge for a long time, and then formed a band that was initially based around Emma's songs, it's made us look outside Cambridge towards other scenes. Emma Kupa: I think it's a bit messier and a bit freer up north. You can't really expect anyone in Cambridge to be particularly excited about what you do. Mark Boxall: I'd like to think people are inwardly excited. Cambridge suffers from being too close to London. DiS: Did you feel there was a level of expectation surrounding Mammoth Penguins from the start, particularly after your output with Standard Fare? Emma Kupa: I'm not so sure about that. I don't honestly think anyone knows who we are. I played a show recently and a member of the audience asked if I was in Standard Fare before we went on. But apart from that, I don't think it's had any bearing on Mammoth Penguins at all. Also, I think the scene has changed a lot so people that may have been into Standard Fare might not necessarily be aware of many new bands since. DiS: The album came out on Fortuna Pop! Was that the label you'd always intended to work with? Emma Kupa: I always wanted Sean (Price, Fortuna Pop! founder) to release our records. We found the scene initially through Thee SPC label in Sheffield and then Melodic who both put out Standard Fare's records. There was a connection between those labels and Fortuna Pop! plus Sean's got loads of amazing bands on his label. He'd always hinted about putting something out by us so I sent him the record when it was finished, asked him what he thought and he said he'd put it out straight away. DiS: Do you feel some kind of kinship with the other bands on that label? Emma Kupa: I've played with most of the bands on Fortuna Pop! at one time or another. Allo Darlin I know really well. We're on the same pages. Mark Boxall: We played with Tigercats a couple of times recently as well. Even though we're quite different musically we share the same ethos as them. DiS: You're still relatively new as far as playing live is concerned? Tom Barden: We've played as many shows this month (July) as we did the whole of last year. DiS: What are your plans for the future? Will there be a follow-up to Hide & Seek? Emma Kupa: We're playing a new song in the live set at the minute which seems to go down well. So we're hoping to try and record before the end of this year. We've got four or five songs already. Mark Boxall: The next set of songs will be coming from the beginning as the three of us whereas the last set were written over a longer period of time and we had a different drummer. This time we're all writing together. Tom Barden: When I first joined the band it was a case of playing catch up to where the other two were, and that was hard work. Emma Kupa: When we all get together we bond really well, and I think that forms the writing too. DiS: Do you prefer working in the studio to playing live? Emma Kupa: We can never afford to work in a studio! You have to go into a studio with everything completely prepared, and then you record it all, then it gets mixed. I'd love to be able to mess around in a studio but it's way too expensive. Tom Barden: That's why we tend to use the DIY approach instead. Anything beyond that would be a luxury. For more information on Mammoth Penguins visit their official website.